In an attempt to boost its Fixed Line services, Bharti Airtel, Asia’s leading integrated telecom service provider, once again announced the launch of Unlimited Sunday for its Fixed Line customers across India for All Sundays in the Month of April. 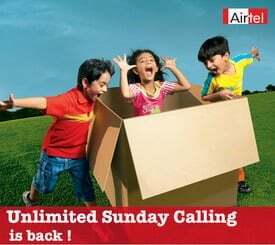 With the launch of this offer, Airtel’s 2.9 Million Fixed Line subscribers now can make Unlimited Free Local and STD Calls on all Sundays in April-2010 ( 4th, 11th, 18th and 25th ), from Airtel Fixed Line to all Airtel Fixed Lines. The Unlimited Sunday facility is auto activated and absolutely free across India with in the promotional period. So go ahead, enjoy those endless conversations with your precious ones. Earlier Airtel’s Unlimited Sunday was offered on February 7 to 21 to its Fixed Line customers for three Sundays during the Valentine fortnight. Mr. Vikas Singh, CMO–Telemedia Services, Bharti Airtel said, “In keeping with this intent, we are happy to introduce Unlimited Sunday which will enable our customers to easily reach out to their friends and families on the Airtel Fixed Line network”. For more information, Airtel subscribers can call 121 from their Fixed Line Phone. R u a Reliance promoter!!! !